Before I dig into the coming Lehman moment out of China, you should understand how China has impacted the world. First, let’s start with debt. Debt sits at the heart of China’s miracle growth. China has more than quadrupled its debt load since 2007. Just between 2007-2014, its debt exploded from $7 trillion to $28 trillion (simply incomprehensible numbers). China’s addiction for growth (in building mega-cities, bridges, roads, etc…) helped push demand for commodities higher (like iron ore, steel, and oil). But the initial day of reckoning came late 2014. The world was unable to absorb the unrelenting Chinese production. In the face of massive excess supply, prices collapsed. The ripple effect hit the energy sector first. Then the materials space… then worked its way through the economy from there. China’s rulers got scared of it death-spiraling. They know that their economy is more sizzle than steak. They know that the books are cooked and the actual economic production is a lot smaller than is reported. They also know that a huge portion of the economy is in debt up to their eyeballs and any drop in prices (iron, copper, real estate, whatever) will lead to pain. So they began lending like crazy. 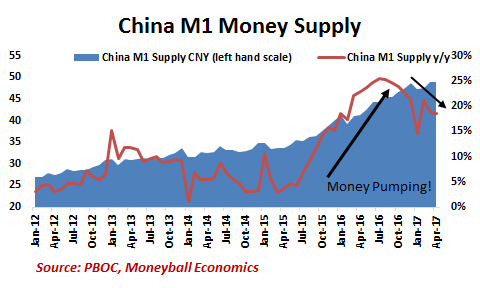 The money supply (M1) raced from a mild 10% annual growth rate to 25% year-over-year. In the past, printing cash pushed up the GDP. But it had no effect. But they cared more about one thing: Housing Prices. Housing is the source of most debt exposure and also consumer spending. That implies an economic slowdown will follow in a few months. Indeed, speculators are reacting to the tightening of easy money. Iron ore prices have collapsed. In fact, the chart below is already obsolete: prices fell a further 5% today. The key point is that demand never really grew. Chinese hot money and gambling bid up prices. Now that the hot money is being curtailed, prices are dropping again. Worse, now the Chinese factories have to dump all of their excess production. Deflation will be coming shortly. It is impossible to see the Fed raise rates 4 times this year. There simply won’t be inflation. Plus, I believe that the Fed was counting on Trump delivering fiscal stimulus. Unfortunately, the window for Trump is closing. It’s already towards the end of May and there’s been no tax plan. Worse, any plan will be set to face a lot of pushback. The ACA move has failed (seriously – after 7 years of complaining and saying that they had a better plan, the Republicans had nothing) and that means sharks smell blood in the water and will push back on every Trump proposal. By June/July, companies are no longer thinking about investment plans. Instead, they are on vacation and, when they return, their minds will turn to winding down the year. 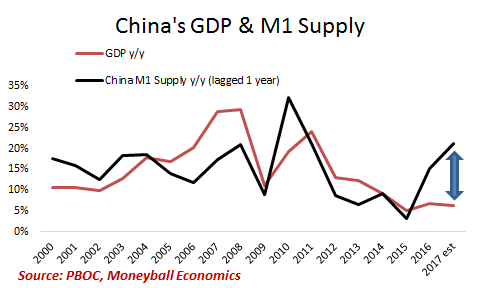 KEY TAKEAWAY: China’s economy has exploded thanks to trillions of debt and other means of fiscal stimulus. They’re doing their best to keep the trillions in bad loans from spiraling out of control. Yet, as you see, the more stimulus isn’t helping increase industrial production. 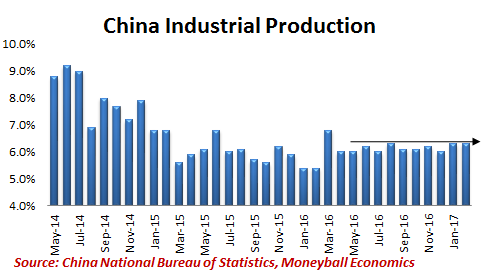 Now, China has to dump all that excess capacity. This will lead to a serious deflationary spiral. Be wary.